Saturday was such a strange day weather wise! Really windy and blustery, but still warm when the wind died down. It was the perfect jeans and tee weather, but I had to go to the physio so couldn't have my knee covered. I added a denim jacket to this, as my friend wearing hers yesterday prompted me to dig mine out, but with the weird weather I kept taking it off and on all day. First time this jacket has been featured on the blog. I had a look for the last time I remember wearing it, and found this picture from 3 years ago where I was covered in parrots, haha! When I first bought it in a City Beach sale around 10 years ago I was so happy at the bargain I got, and wore it over and over. Although it's rarely worn now, I keep it around as I think everyone can use a denim jacket sometimes. Linking up with Plane Pretty, My Style Monday today. Last worn: colour block dress, owl necklace, studded sandals, Rebecca Minkoff silver mini MAC. the jacket is old, but it's the first time I've worn it on the blog. The necklace and bracelets are from my friend's jewellery line. If you have Pinterest, she has a board setup that you can view or pin here. Last worn: skinny jeans, Havaianas thongs, Rebecca Minkoff aqua mini MAC. First time I've worn the top as it's a new purchase. denim jackets are definitely a closet staple. i hardly wear mine but i love knowing it's there. it still fits you so well, haha. i think some of my older things are way too small now. love the colourblock dress and the RM bags, both great colours! weather here has been a bit weird also, poured down today. hope your knee is ok! I'm a new follower and would love for you to check out my blog! I love the first dress and I am drooling over the RM bags!!! I love jeans in the bottom picture - I have a thing for printed jeans at the moment. Yours are adorable! Love the dress...the color blocking and high low hem are great. The parrot pic is too funny! Birds terrify me, so you're really brave in my opinion...ha! I love birds, so it was really fun, but I was a little scared in that picture as two of them had just been fighting, haha. The last dree is soo cool! I love the cool hi/low dress - and everyone can use a jean jacket! Love the pretty high-low dress you wore it on top of too. Also, cool print jeans in the second outfit! You are rocking these mini MACs!! I wish I could use them too (with what I need the mini is too small). Mini comes in so many great colours and texture (love the snakeskin one you have)! I just love the RM bags! Your bag is so gorgeous! What a great dress. And isn't it great we can bring back our old denim jackets! Those Sass and Bide jeans are so cute! i love that hi and lo dress mica. the print & colors are so pretty on you. love that owl necklace and denim jacket with it. great pants in the second outfit. 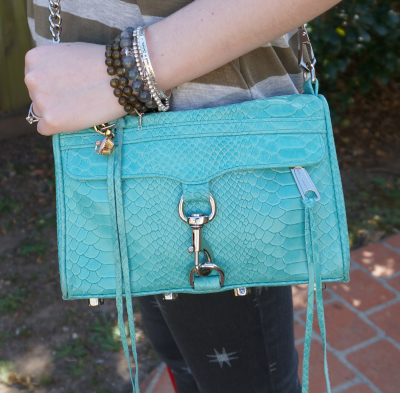 gorgeous rebecca minkoff bag. Those Havs are so cute! Fun pattern mixing on the 2nd outfit. I agree - you can never go wrong with a good denim jacket. I did replace my denim jacket because my old one did not have any stretch. I don't wear mine too often but I know it will last me for years to come. love the bags! the blue is definitely my fav, super eye catching! Love the 2nd outfit, great jeans!! I love both of your Rebecca Minkoff bags!!! I have one in black but I'm thinking I need to get my hands on some more fun colors and fabrics! Cute dress and I love the printed pants! yay for rebecca minkoff!! :D love her bags!! Gah so jealous. love Rebecca Minkoff. Where did you get the mini macs? 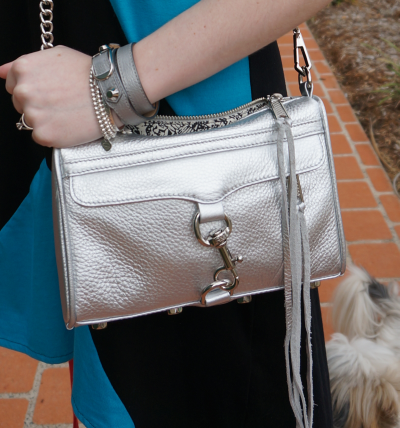 Ooo loving the Rebecca MInkoff.